Whether it be a small indie feature or big hollywood blockbuster, films have often provided social commentary reflecting the time they were produced. As the recession hit in the ’70s, Hollywood became a very grim industry often only producing very grounded films about the darker aspects of life. The ’80s brought us hope in movies as the economy hit an all time high. The late 2000s and early 2010s have seen a return to the griminess of Hollywood’s past with films that emphasize the more grounded aspects of reality that we’d see more often in the news than on the big screen. Science Fiction is at times both spectacle and social commentary, and simultaneously magical and contemporary. Unlike other genres, science fiction examines how the world was, is, and should be all at the same time. Social situations from war to slavery and apartheid have been examined through a different lens with the works of science fiction. This summer’s “Elysium,” the sophomore effort from “District 9” director Neill Blomkamp, examines classism and wealth in a future dystopia. Like Blomkamp’s directorial debut, “Elysium” is a work of social commentary disguised as a science fiction blockbuster. Whereas “District 9” examined how South Africa was in the times of apartheid, “Elysium” gives us a look at how the world may end up if wealth distribution and overpopulation take its toll. The story tells of a classist society where the wealthy and privileged live on a man-made utopia called “Elysium.” Lower class and less fortunate individuals, however, remain on an Earth in ruins where poverty, sickness and overpopulation have turned the planet into a slum. The allegories and symbolism of the difference between first and third worlds are blatant and are further driven home as the story unfolds. “Elysium” follows Max DeCosta, played by Matt Damon, as he tries desperately to reach utopia despite militarized efforts to keep him from doing so. When he stumbles upon something that could change the lives of billions, Max must reconsider his initial motives for entering Elysium. The film suffers from some questionable motivation by supporting characters like Kruger, played by the brilliant Sharlto Copley, and Spider, who helps sends Max on the assignment that will ultimately lead to his decision. Kruger, a Rogue agent hired by Elysium’s secretary of defense without the knowledge of the film’s board of officials, is a memorable baddie who commits acts of evil with pleasure. Despite his motivations being clear toward the beginning of the film, it takes a drastic and unnecessary shift in the third act. Although the film is original and quite imaginative, it suffers from usual dystopian cliches and situations that do nothing but advance plot. The final act of the film suffers from acts of terrorism we’ve seen so much of lately in films of this nature. The good in this film outweighs the bad in my opinion. The visuals are stunning and have that same industrial aesthetic that “District 9” possessed. The performances from the leads are wonderful, with Copley as the standout. The cinematography was a highlight in the film due to the utilization of unique camera techniques and angles, something most cinephiles would definitely appreciate. t goes out of its way to make them out as pure evil with no actual motivation of keeping Earth’s citizens out other than the obvious inevitable overpopulation. 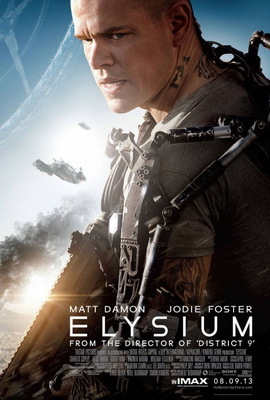 Still, “Elysium” is a film worth viewing, whether social issues are your forte or just great visuals and a fun time. It’s a film that’s full of suspense, action and solid storytelling and I recommend it be seen while in theaters nationwide.